Last week the US recognised Juan Guaidó, head of Venezuela’s National Assembly, as the country’s rightful president. It was quickly joined by countries across the Americas including Canada, Brazil and Colombia in demanding Nicolas Maduro step aside. The EU abstained from immediately joining such calls, saying instead that it supports the National Assembly as the “democratically elected institution” and that Maduro had eight days to call fresh elections. In the absence of that, it would have little choice but to follow Washington and recognise Guaidó as the country’s legitimate leader – something already explicitly stated by the UK, Spain, France and Germany. The reasons for such a sudden shift are wide-ranging and often ambiguous, with Maduro’s critics highlighting democratic shortcomings, human rights abuses and economic mismanagement as adequate grounds for regime change – as if all three were somehow equivalent. On the charge of mismanagement, there is no denying Venezuela’s economy is collapsing. It has been in recession for five years, with GDP falling by as much as 50% since 2014. With the exception of Greece in Europe – where GDP fell by a third between 2010 and 2018 – that is unprecedented in a modern peacetime economy. Unsurprisingly many have chosen to leave the country, with it being estimated that more than one million Venezuelans have emigrated since 2015. The vast majority of those that remain face poverty and malnourishment. According to the World Health Organisation the average Venezuelan lost 11 kilograms in 2017. Of perhaps even greater concern, 85% said drugs were either impossible or highly difficult to access. Infant mortality rates, after years of steady improvement, are on the rise. Perhaps more widely known is the hyper-inflation the country faces. While high inflation has been a long-standing feature of Venezuela’s economy, in the last several years the situation has dramatically deteriorated, with the annual rate of inflation reaching an astonishing 80,000% last year. But what explains all this? How can an economy which, we are told, was so wealthy prior to Hugo Chávez becoming president in 1998, have fallen so far? Part of any answer must start with an admission. Despite it being singularly ignored in much media coverage, Venezuela’s economy was no success story in the late 1990s. Indeed GDP per capita in 1998, after adjusting for changes in dollar value, was the same as it had been in 1963, and down a third from its peak in 1978. Furthermore the purchasing power of the average salary was little more than 30% of what it had been some two decades earlier. In other words, the crisis which precipitated the rise of Chávez resembled the country’s present circumstances. What’s more, for the first fourteen years of the Chávez government the economy expanded significantly. Between 1998 and 2012 GDP per capita more than tripled, meaning Venezuela pulled away from similar sized economies like Peru and Colombia. By 2006, and for the first time since the late 1980s, it was wealthier than Argentina. This economic growth demonstrably translated to social progress. By 2012 Venezuela had the lowest levels of inequality in the region, with poverty falling from 70.8% in 1996 to 21% in 2010. By the time of Chávez’s death in 2013, more than 6% of GDP was spent on education with citizens enjoying free daycare nurseries and university degrees. While 21% of the population experienced malnourishment in 1998, by 2012 that figure had fallen to 5%. Elsewhere infant mortality halved, while the number of doctors relative to the population tripled between 1998 and 2012. Perhaps it should come as little surprise, then, that as recently as seven years ago Venezuela was found to be one of the happiest countries in the world – much to the chagrin of the Financial Times. So what changed to make such a success story go into free fall? The answer, in a word, is oil. The success of the Venezuelan economy under Chávez was in no small part due to the historically high price energy commanded, with this allowing for an unprecedented increase in state spending. With oil accounting for 95% of the country’s exports, to say Venezuela was and remains dependent on energy exports is an understatement. When the price of oil started to fall after 2013, it was inevitable major problems would start to emerge. Even more troubling than the falling price, however, is how oil production in the country has more recently entered a precipitous decline from which it has yet to recover. 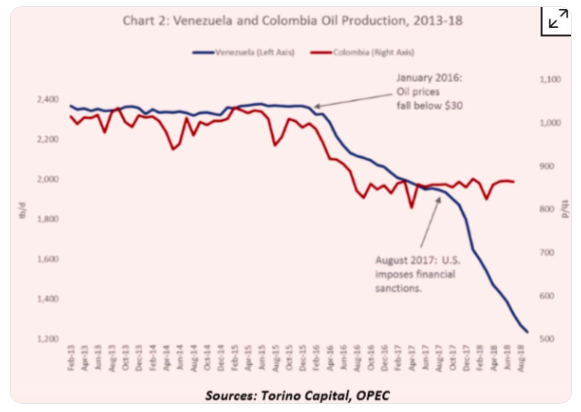 As the table above demonstrates, as recently as early 2017 Venezuelan oil production followed the same pattern as that of Colombia. This clearly changes in August, however, when Donald Trump’s new sanctions came into force. As you can see, a decline in production was initially driven by the price of oil hitting its lowest point in about a decade at the start of 2016. But in August 2017, when Trump’s sanctions made it illegal for the Venezuelan government to obtain financing from US institutions or individuals, a major shift occurred. This had two consequences. The first related to the fact that all the Venezuelan governments’ outstanding foreign currency bonds were subject to New York state law. The second was that because one of the country’s major assets – the state-owned CITGO corporation – was based in Texas, it could no longer send profits and dividends back to Venezuela. These had been averaging around $1bn a year since 2015. According to one study the impact of these sanctions since 2017 is enormous, with the difference over a twelve month period reaching $6bn – 5% of the government’s nominal GDP. Thus the recession the country is presently facing can be attributed to the same factors behind Venezuela’s economic stagnation in the 1980s and 1990s: low energy prices. This time, however, they have been joined by sanctions which have turned economic inertia into a situation that borders on the catastrophic. Export industries which had previously atrophied because of an ever greater dependence on energy exports since the early 2000s, often termed ‘Dutch Disease’, have been unable to recover. Then there is hyperinflation. The primary cause of this, it appears, is a massive expansion in the country’s money supply to cover rising budget deficits – themselves a result of pronounced recession and falling government tax receipts. In essence the government is printing money (although in the 21st century this is digital) to finance its own spending, rendering the currency close to worthless. There is therefore an intimate relationship between the country’s economic recession, massive deficits and hyperinflation. To a significant extent the depth of each has been profoundly deepened by US sanctions. This is no accident. Indeed the intention behind them is to starve the country of importing goods and its all important oil industry accessing the necessary credit to even maintain present production. Indeed according to a report issued last year by the International Energy Agency, Venezuela’s production capacity dipped to just 1.38 million barrels per day in 2018, its lowest average since 1950. Falling prices and dwindling production spells disaster. The US has pursued a similar strategy with another major oil producer it can not easily defeat through military means: Iran. While capacity there has held up better than in Venezuela – and the economy is more resilient after decades of sanctions – Trump walking away from the nuclear deal last year meant Iranian oil exports fell to a five year low in November. While Iran is not experiencing hyperinflation, the country’s currency – the rial – experienced an 80% devaluation last year. Indeed the strength of Washington’s sanctions against Venezuela and Tehran are reminiscent of those against Nicaragua in the 1980s. Then, as now, they had the desired effect as the central American economy went into recession and hyperinflation. Falling GDP, widening budget deficits, hyperinflation and a collapse in living standards is not a side effect – it is the strategic objective. As Richard Nixon put it ahead of placing sanctions on Chile prior to Salvador Allende coming to power in 1970, the aim is to “make the economy scream”. Understandably, the US State Department is not keen to pronounce overtly why it is waging economic warfare against other countries. Consequently sanctions are instead tied to the idea of personal corruption. After the introduction of Trump’s 2017 sanctions, Treasury secretary Steven Mnuchin stated how the intention was to restrict the Maduro regime’s access to American debt and equity markets. “Maduro may no longer take advantage of the American financial system to facilitate the wholesale looting of the Venezuelan economy at the expense of the Venezuelan people.” How accessing loans is the basis of ‘looting’ – especially when a country has such extensive mineral wealth – remains unclear. While the US says sanctions are about stopping cronyism, the reality is they are about ensuring the country’s petroleum industry can’t get access to credit. It’s no surprise, then, that US politicians have openly discussed the possibility of diverting sources of credit exclusively to Guaidó. Starving a country of credit lines, and then offering them exclusively to a person who isn’t the president – but who you say is – is what regime change looks like in the 21st century. While sanctions introduced by Barack Obama in 2015 were done under the bizarre pretence that Venezuela was a ‘threat to national security’, there have been moments, however, where the US has admitted its intentions in Venezuela. In 2005 Pat Robertson openly asked on national television why Chávez couldn’t be assassinated under the Monroe Doctrine. More recently president Trump said: “We have many options for Venezuela including a possible military option if necessary”. While praising the election of Jair Bolsonaro in Brazil last year, John Bolton – appointed national security advisor by Trump earlier in March – denounced Venezuela as part of a ‘Troika of Tyranny’ along with Cuba and Nicaragua. That rhetorical flourish and its resemblance to the ‘axis of evil’ by George W. Bush is no accident. Bolton was under secretary of state to the former president, and his CV includes ensuring US citizens were exempt from prosecution by the International Criminal Court and calling for pre-emptive strikes against Iran and North Korea. Elsewhere he supported the NATO-led intervention in Libya in 2013, and is something of a rarity in that, even now, he defends the wisdom of America’s 2003 invasion of Iraq. Given Bolton is as hawkish as they come, it is remarkable that the governments of the EU and Canada have decided to sing along to his tune. Quite the diplomatic achievement for a man who once declared: “There is no United Nations, there is an international community that occasionally can be led by the only real power left in the world, and that is the United States”. But what would Guaidó do in the event of regime change proving successful? Early indications are obvious enough. The oil reporting agency S&P Global Platts reported that even prior to the US anointing Guaidó as Venezuela’s “president” he had already drafted “plans to introduce a new national hydrocarbons law that establishes flexible fiscal and contractual terms for projects adapted to oil prices and the oil investment cycle.” Such a plan would involve the creation of a “new hydrocarbons agency” that would “offer bidding rounds for projects in natural gas and conventional, heavy and extra-heavy crude.” In other words, Venezuela’s oil wealth would be rapidly subject to privatisation and ownership by major multinationals. Again, this should come as no surprise – the precise same thing happened after Washington-driven regime change in Nicaragua, Chile and El Salvador. Alongside that, Guaidó would likely receive extensive loans from the IMF and US. These would serve to restructure the Venezuelan oil industry, balance the budget deficit and pay back current holders of Venezuelan debt – serving to enhance its international credit profile. Naturally such loans would be contingent on ‘structural adjustment programs’ which would see vast swathes of the country’s resources, from its gold and bauxite to its hydroelectric power plants and iron ore production, put into private hands. At the same time the country’s currency, the bolívar, would be pegged to the dollar and American companies would be encouraged to invest in the country. Quickly oil production would increase and the economy would grow, with this leading to currency stability. The likes of the Economist, the common sense of the establishment, would pronounce once more that ‘socialism had been found wanting’. And yet all of this, from currency stabilisation to re-opening lines of credit, could happen with Maduro in charge. The point is, of course, to create regime change through what Caracas rightly refers to as ‘economic warfare’. Yet even the above scenario, where Guaidó helps re-establish the Washington Consensus in the country, is wantonly optimistic. Far more likely is that the country would be plunged into civil war, either along the lines of Syria, where much of the military sides with Maduro and foreign powers become involved, or Colombia, where a low-level guerrilla insurgency wages on for decades. Given the enduring strength of Chavismo as a social force, even now, either scenario should not be easily dismissed. For the likes of John Bolton and US secretary of state Mike Pompeo, that isn’t an issue. As long as the US has favourable regimes across Latin America, and exercises political control over the world’s largest known oil reserves, the broader situation regarding human rights and democracy is irrelevant. You need only listen to Bolton’s recent comments on the killing of Jamal Khashoggi to know the importance he places on the rule of law and journalistic freedoms. Which makes the recent interventions of the governments of Europe and Canada all the more disgraceful. Perhaps they have already forgotten Iraq or care little for the political fallout in a country so far away. For the left, however, the solution is obvious. Reject all calls for regime change in Caracas and demand an immediate end to sanctions. Yes, the Venezuelan people are subject to a living hell which is only getting worse. But that is the intention behind US sanctions. Now, as with Chile more than forty years ago, they are designed with one thing in mind: “to make the economy scream”. Inflicting humanitarian crises on other countries is not how democracies are meant to behave.